Some ingredients are just meant to be together. Chickpeas + feta + lemon. The crunchy avocado slaw is my favorite part. It's super flavorful, super easy, and super delicious. 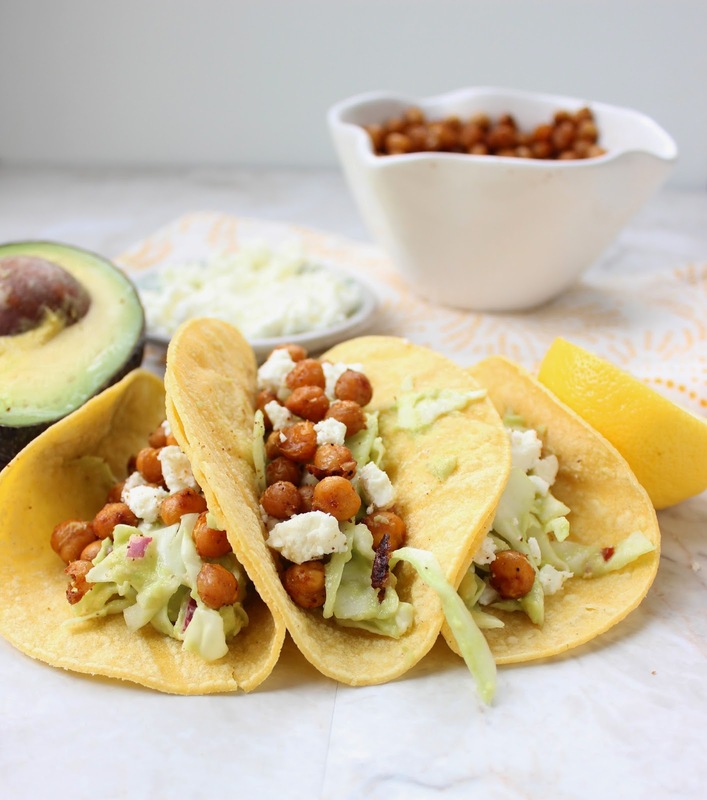 These tacos are perfect for a quick weeknight vegetarian dinner, and the roasted chickpeas are also a satisfying, protein-rich snack. This is definitely an unusual combination of ingredients, but I've got my boxed-macaroni-and-cheese-oreo-poptart-loving-husband eating these tacos, so I think you and yours will enjoy them too! 1/2 head green cabbage, finely chopped. In a small bowl, combine mashed avocado, lemon juice, and red onion. Stir briskly and let sit for about 5 minutes. Pour avocado mixture over cabbage. Stir to combine. Add red pepper flakes, green jalapeño sauce and salt & pepper to taste. *This is best to eat the day it's made! Preheat oven to 450. Prepare a cookie sheet by covering with parchment paper or aluminum foil. On the baking sheet, combine chickpeas, spices, and olive oil. Use your hands to ensure chickpeas are evenly coated in oil and spices. Bake for 7 minutes. Remove from the oven and stir the chickpeas around. Return to the oven and bake for an additional 7-9 minutes or desired crispiness. Warm corn tortillas in the microwave for 10-15 seconds. Fill with slaw, chickpeas and feta. Enjoy! 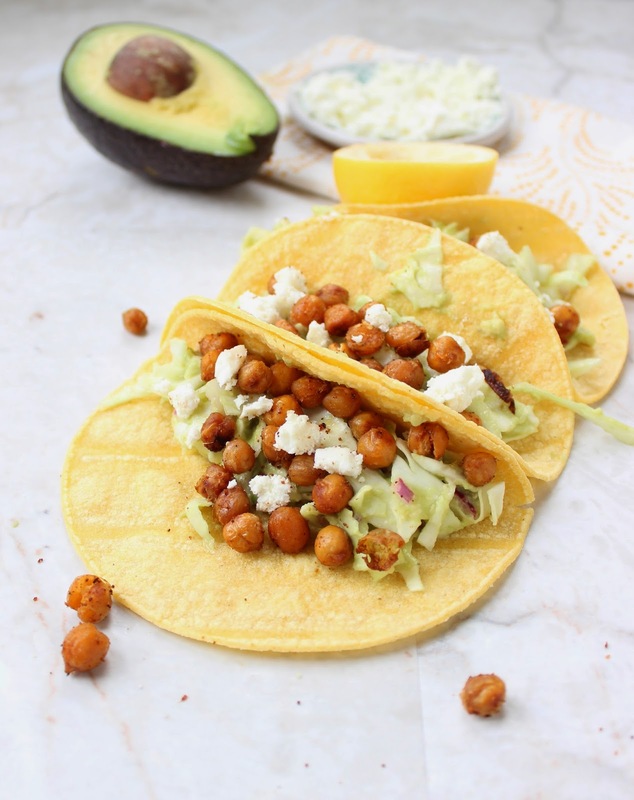 These look so fresh and delicious -- a great vegetarian taco! Totes agree. This is a combo for the AGES! And by ages, I mean my belly. It belongs in my belly.